If you're fear-averse and dare-inclined, you'll want to make a stop at Buffalo Bill's in the community of Primm before or after your adventure in Las Vegas. Located about 40 miles south of the Strip at the Nevada/California border, this resort is home to an array of spine-tingling, thrill-inducing rides. Take the Desperado, for example. 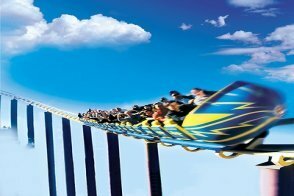 At one time it was the world's tallest and fastest roller coaster. Today, it still packs a pretty powerful adrenaline punch -- dropping 225 feet and traveling at more than 80 mph. Buffalo Bill's also boasts two terrifying virtual rides. The Maxflight Cyber Coaster simulates wildly twisting roller coasters from around the world. A little less scary but equally scream-worthy is the Adventure Canyon log flume. Because of these and other attractions, Buffalo Bill's is a wonderful place for families. All ages are sure to love the arcade, which is stocked with action-packed video and pinball games. Youngsters will want to leap on the kid-sized Frog Hopper free fall ride as well. Entertainment is also done in a big way at Buffalo Bill's, thanks to the Star of the Desert Arena. The indoor venue has 6,500 seats. 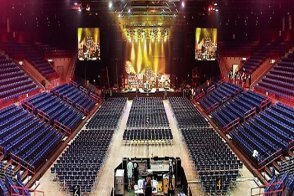 Used primarily for concerts and special events, it has also become popular with Mexican recording artists. That's because Ramon Ayala, a mariachi-oriented performer known as the "King of the Accordion," appears in sell-out shows a few times each year. There are a variety of casual dining options too. Denny's, which is open 24/7, features a menu of tried-and-true favorites sure to satisfy any craving. Or grab something quick at La Salsa Fresh Mexican Grill, Panda Express and the Ice Cream Shop. 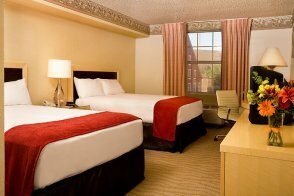 Rooms at Buffalo Bill's are modern and clean, providing comfortable amenities like contemporary bedding, cable TVs with Pay-Per-View movies, hair dryers and wireless internet access (for a fee). Overnight guests will also appreciate a dip in a fanciful pool that's shaped like a buffalo's head. Moreover, a stay at Buffalo Bill's allows for the chance to explore its sister properties. Primm Valley Resort & Casino, which is connected to the Fashion Outlets of Las Vegas, is located next door. Whiskey Pete's is situated on the other side of the I-15. Free shuttle service is offered approximately every half hour between all three of them. Yes, 46,000 square feet. 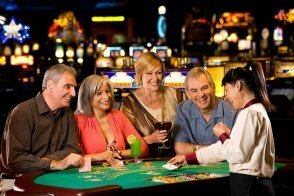 Casino games consist of blackjack, Caribbean Stud poker, craps, keno, Let It Ride, pai gow poker, poker, roulette, Big Six Wheel and plenty of video poker and slot machines (including Megabucks). The casino has a poker room and a "party pit." Yes, a 40-seat race and sports book, equipped with 20 televisions and four big screens. Buffalo Bill's has the following dining options: La Salsa Mexican Grill, a food court and a Denny's. The 6,500-seat Star of the Desert Arena and the Stage Bar feature live entertainment. There is also the Carolee Theater, playing classic or modern-day movies. 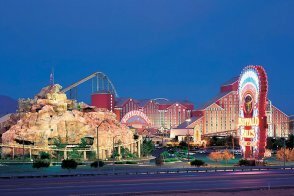 Ride attractions include the Desperado roller coaster, Adventure Canyon, MaxFlight 2002 Virtual Roller Coaster, Frog Hopper and a state-of-the-art arcade. Yes, one buffalo-shaped pool and a Jacuzzi, both outdoors. No, but guests are welcome to use the one next door in the Primm Valley Resort & Casino. No, but guests can go next door to the Spa at Primm Valley. Yes, Houdini's Magic Shop, The Ghost Town Gift Shop and the Everything's $10 store. The Fashion Outlets of Las Vegas (with more than 100 stores) is also located in the vicinity. Yes, but there are convention, meeting and special events facilities next door at the Primm Valley Resort & Casino. Yes, it's included in the resort fee. No, but there is free parking for RVs with no hookups. 3 p.m. Early check in between 10:00am and 1:00pm for $10 plus tax. Resort fee Buffalo Bill's has a $18.14 per room, per night resort fee. This fee is not included in your reservation and will be collected by the hotel. Local and toll-free phone calls. A discount card for the Fashion Outlets of Las Vegas and a coupon book with other special offers. This 335-square-foot room features one king or two queen beds. The bathroom has a single sink and a combined tub/shower.